Americans are bombarded with conflicting advice when it comes to cutting their carbon footprint. After two years of research and analysis, we uncovered the most effective individual steps each American can take to fight global warming. Cooler Smarter challenges you to cut your carbon emissions 20 percent this year and gives you the information you need to succeed. By Seth Shulman et al. Island Press, 2012. 328 pages. $21.95. 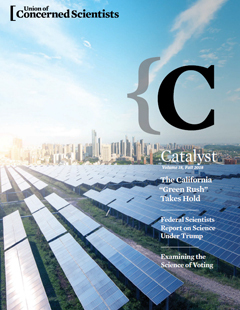 Members receive a free subscription to Catalyst, the official magazine of the Union of Concerned Scientists. Published three times a year, it brings readers a better understanding of the science behind critical issues and a behind-the-scenes look at the people and work of UCS.